As summer camp marketers, sometimes we struggle with how to effectively market our programs to parents and kids alike. It's imperative we appeal to both groups, but figuring out how isn't always easy. We tend to overthink what we're doing, then get frustrated trying to decide who to tailor our marketing content for, and whether we're doing it the right way. But it's not as hard as you think. I have a strategy I use at my own camp that helps me simplify my marketing in this regard, irrespective of whether I'm creating online of offline marketing content: I use pictures, images and video that appeal to kids, and text that appeals to parents. If you struggle with creating duel marketing messages that effectively target parents and kids together, try this strategy and you'll be fine. The reason it works is because kids and parents often browse the internet together, but even when they don't, we know the kids will eventually show their parents your cool website (or ads, social media, whatever) since their parents are making the financial decisions anyway. Moreover, even when kids can read, pictures and videos will always grab their (short!) attention spans faster than text. So your first step is to intrigue your prospective campers with pictures and videos, then they'll be prompted to bring the idea of signing up for your camp to their folks. Here's two examples you might be interested in. Last year a teenage girl contacted us on Instagram. See saw a few photos we posted about our Hawaii overnight camp retreat. We know teens use Instagram like crazy, so once our photos caught her eye, she had her dad email us for more info and to get the conversation going. She eventually signed up for the program, all because 1) she saw a photo of our camp online, and 2) showed it to her parents and influenced them to register her for camp (in that order). Here's the second example. I've discussed this before but it's worth revisiting. 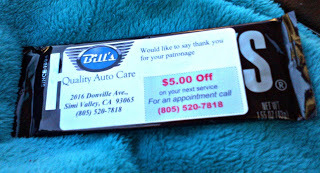 When I took my car in a while back, the mechanic gave me a Hershey bar with a coupon wrapped around it for a discount on my next visit. One of my boys was with me when we picked up the car. Naturally the text on the coupon (to save money!) is what caught my eye, but the candy appealed to my kid. The mechanic's marketing strategy worked like a charm. My son still talks about the candy bar he got from the car place, and I saved a little money on my next tune-up. Just one more thing I should mention. It's worth noting there are certainly some exceptions to this "text for parents, images for kids" marketing rule. For instance, if you're creating a web page direct exclusively at teens, you might want to rethink this (and you also better be sure such content is LEGAL and APPROPRIATE, but that's another story). In general though, this is an easy-to-follow strategy that will not only make creating your marketing content easier to create, but by employing it, the end result will almost always work in your favor.